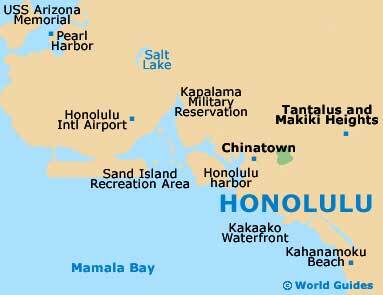 Hawaii's famous city of Honolulu features a wealth of spectacular, tropical golf clubs and golf courses, many of which are located in or around Honolulu, often with spectacular views of the surrounding natural scenery and coastline. There are also further golf courses is Honolulu's picturesque surrounding suburbs and advance golfing tee-time reservations may be required, so it is often sensible to check this, together with any dresscode requirements, before arriving at the golf course. 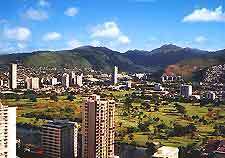 The Ala Wai Golf Course is situated in the Waikiki of Honolulu and is a particularly busy and popular 18 hole golf course. With a golf par of 70 and a driving range, the Ala Wai Golf Course features reasonably priced golfing fees, dependent on the time of year. Honolulu's Coral Creek Golf Course can be found on the northern side of the city and is home to excellent modern golfing facilities, together with exceptional views and numerous water hazards. Other attractions at the Coral Creek Golf Course include a large professional golfing shop, a practice putting green and a driving range. The Hawaii Kai Golf Course is located on the eastern side of Honolulu and comprising two separate 18 hole golf courses, attracting both medium-skilled and more experienced golfers staying in the Honolulu area. Although the golfing fees are fairly expensive, the golfing facilities are excellent and throughout the year, the Hawaii Kai Golf Course hosts a number of championship golf tournaments. Sited on the shore of the O'ahu Island, within easy reach of central Honolulu, the Ko Olina Golf Club is known for its challenging holes and major golfing events. Facilities at the Ko Olina Golf Club include a large golf clubhouse, a well-stocked golf shop and a popular restaurant. With two 18 hole courses named after there designers Arnold Palmer and George Fazio, spreading views and a particularly peaceful atmosphere, the Turtle Bay Resort is becoming an increasingly popular place to play the game of golf. Standing on the Island of Oahu, close to Honolulu, the Olomana Golf Links course is favored by the locals in this area of Hawaii. Attractions at the Olomana Golf Links course include stunning views of the surrounding natural landscape, a driving range, practice areas, golf instructors and golf equipment hire. The Waikele Country Club, in northern Honolulu, remains one of the most popular golf courses in the whole of Hawaii. Featuring 18 holes, spectacular views, a golf par of 72 and numerous lakes, the Waikele Country Club is also known for its large golf clubhouse.